Power currents (a. c.) can be measured simply by means of a clamp meter which acts as a current transformer. The instrument tongs are clipped round a single insulated conductor – the circuit is not interrupted. The value of current is obtained from the magnetic flux strength around the conductor and is usually displayed on a digital display. Direct current (d. c.) measurement is also available with clamp meters having a flux-voltage transducer known as a “Hall-effect” device. Many modern clamp meters are virtually multimeters with the addition of facilities to measure voltage and resistance as well as measuring currents up to 1000A. CARE must be taken when measuring the current in uninsulated conductors. More advanced clamp-type meters can indicate power and power factor in single and three phase a.c. circuits by using additional connections to measure voltage. What would a clamp meter indicate if clipped around a 3-core cable which is known to be carrying 100 A a.c. to a motor? 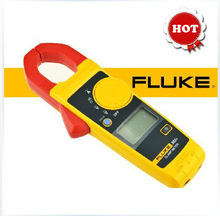 This is because the clamp meter monitors the magnetic flux around the cable which is produced by the current. In a balanced 3-core (or 2-core for that matter) cable, the net flux is zero – hence no indication. This is why the clamp meter is only connected around a single conductor.